Due to New York City’s strict anti-pollution laws, diesel locomotives are not allowed to be operated within the city, and Grand Central Terminal is equipped with third-rail electric power to facilitate train movements in and out of the city. However, the New Haven Railroad had several branch lines that did not have electric power, and were forced to change from diesel to electric locomotives on commuter trains heading into New York. Dissatisfied with the amount of time this procedure took, the New Haven turned to the Electro-Motive Division (EMD) of General Motors (GM) for a unique solution. Built in November of 1960, #2058 is the second to last of sixty unique dual-powered FL9 locomotives designed and built specifically to address the New Haven’s needs. On the branch lines, the locomotive drew power from its on-board 16-cylinder 567C diesel engine, but once it reached electrified territory near New York City, it could convert to third-rail electric power for the remainder of the trip into Grand Central. This eliminated the locomotive swap and shaved precious minutes off the New Haven’s commuter schedules. The locomotive rode on a two-axle front truck and a unique three-axle rear truck that supported the extra equipment required for third-rail electric pickups. On February 2, 1969, the New Haven became part of Penn Central, and the #2058 was renumbered to PC #5058. It would continue to serve admirably for its new owner, and was transferred to Conrail as their #5058 on April 1, 1976. When Metro-North took over commuter operations in 1983, this locomotive became Metro-North #534. It was soon renumbered to Metro-North #2024. Ten of the Metro-North FL9’s were sold to the Connecticut Department of Transportation (CDOT) and rebuilt in 1993 by Morrison-Knudsen. They emerged fully repainted in the New Haven’s iconic McGinnis-era paint scheme, and #2024 was among them. 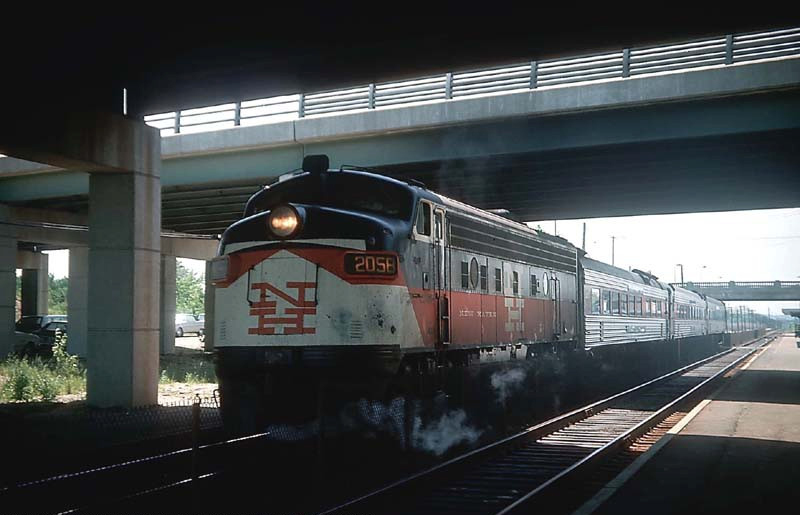 It saw service in Connecticut until 2007, when it suffered an electrical fire and was sidelined in New Haven, CT pending disposition. All remaining FL9s were retired in 2009. Webb Rail purchased the locomotive in 2018 and moved it to the Berkshire Valley Scenic Railroad in Lenox, MA, where plans are to return the locomotive to its original New Haven number (#2058) and restore it to operation.